When fall arrives, we begin having more at home family dinners. The entire family is ready to spend more time at home being warm and cozy. 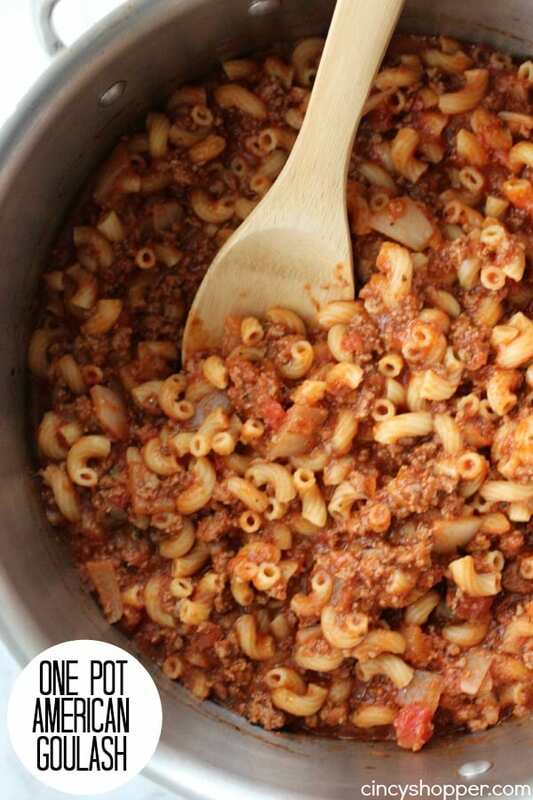 Our family likes to enjoy comfort foods like Slow Cooker Chili and Stove Top Mac & Cheese as well as casserole dishes that really fill us up. This weekend, a bit of chilly weather hit Cincinnati. We all spent the majority of our weekend in pj’s watching movies. Since we were all in the mood for comfort food, I decided a casserole would make for a great Sunday dinner. 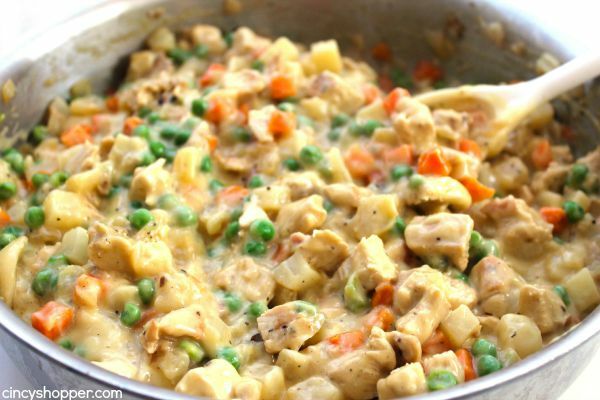 I whipped up this Chicken Pot Pie casserole for all of us to enjoy. 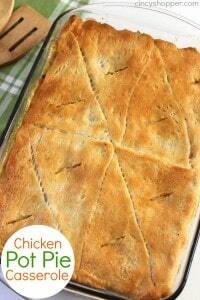 Since my kiddos love our CopyCat KFC Pot Pie, I made this casserole very similar. The chicken drenched in a gravy mixture with carrots, peas, and potatoes was a hit. The store bought crescent rolls kept me from spending too much time in the kitchen. This casserole was perfect, quick, easy, and delish. Dice chicken into 1/2″ cubes. Grease a 11×13″ baking dish. Unroll 1 can of crescent rolls and pinch perforations to seal into a sheet. Press into bottom and up sides of prepared disk. Don’t worry if sides do not go all the way up. We had one piece left of this casserole and I am looking forward to heating it in the microwave for lunch today. YUM! 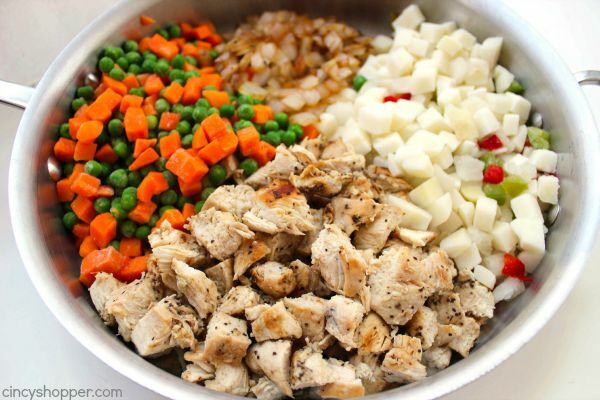 Do you have a favorite fall casserole that you make quickly during the fall and winter months? Yummy!!!! Will definitely make this again. I cooked my chicken in the crock pot and made this yummy dish after work. Do the bottom crescent rolls not burn when you bake it all together since they are prebaked?? No the bottom does not burn as there is moisture in the sauce. It also does not get soggy. The crescents make this pot pie awesome. I only have one roll of crescent rolls- suggestions? 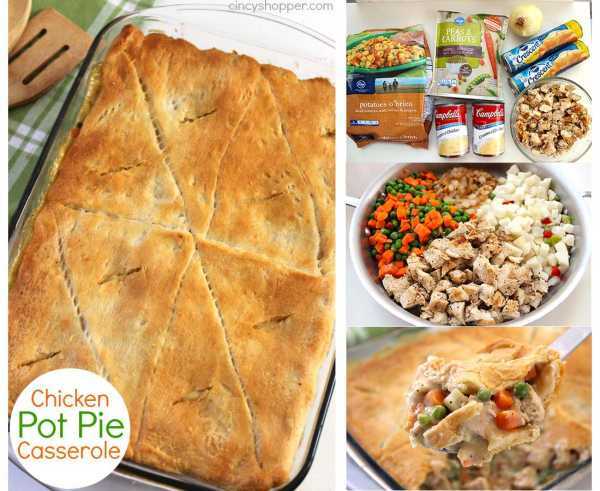 Wondering if I could use the crescent roll bottom but top this with mash potatoes instead of crust? Hope someone reply’s quickly, wanted to make this today …. Hi John!I bet that would make for a great variation. I would wait and put the mashed on towards the end. Be sure to let us know how this turns out for you. It sounds delish! This looks great! Do you thinking making this the day before and popping it in the oven once you’re home from work would be ok? Or would that make the bottom crust soggy? Just trying to figure out how far I could go in the make ahead process for a quick weeknight meal. Thanks! I just cut up boneless chicken breaststroke with chopped onions and cooked in crock pot on high for a few hrs. And added two cans of well drained veggies a can of cooked sliced potatoes and 2 cans of the soup with seasonings. Kept it on low (or warm) for 1/2 HR. easy, fix crust as suggested. I also added quarter stick of butter to slow cooker pot . I would not put a bottom crust if you’re going to do that or it will get soggy. You could make the filling the night before and then assemble the casserole with your crescent rolls when you’re ready to bake it, that won’t take more than a few minutes. Good luck! I am going to try this tonight, but I don’t have frozen veggies on hand, I will use canned strained and hope it’s not too gooey. Also, I am going to pan fry my chicken and onions from raw while baking my bottom crust. I made this for dinner tonight it was absolutely delicious!!!! Thank you! ? 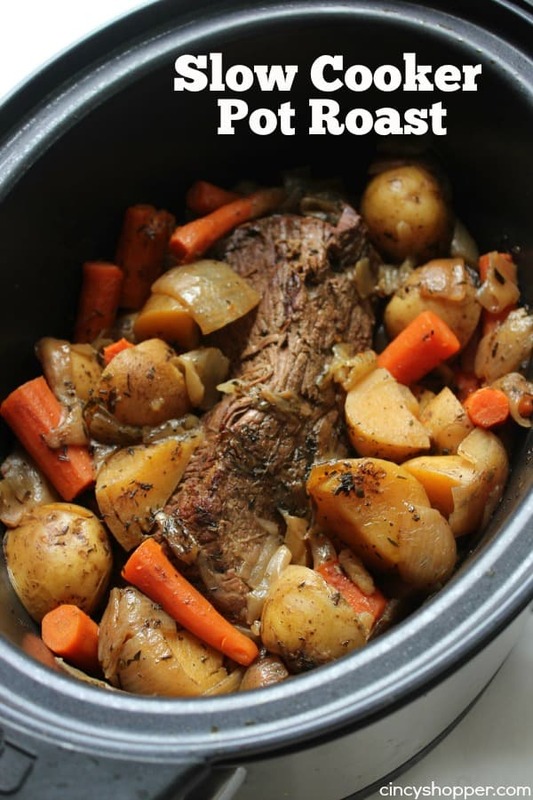 Where is the recipe for crock pot beef stew that was on Pinterest? When I click on the peef stew I get the recipe for chicken pot pie. Thank you I’ll have to try that next time. It was kind of annoying to have to fix the lines. Tried this last night. It was really simple to make and tasted good! One thing I’d probably try next time is replace the top crust with pasty dough so it’s more flaky. This recipe lacks flavor. It’s pretty bland. I followed directions exactly, used all the same ingredients. I even added spices to add some flavor but it didn’t help much. It turned out right, I mean it’s just like the picture just doesn’t taste great. It is a good base recipe but if I made it again I would have to come up with some adjustment. Have you tried switching one of the cans of Cream of Chicken to Cream of mushroom? Try seasoning your chicken the way you would if you were just eating that on its on. I used salt pepper and adobo.super good but not too much. 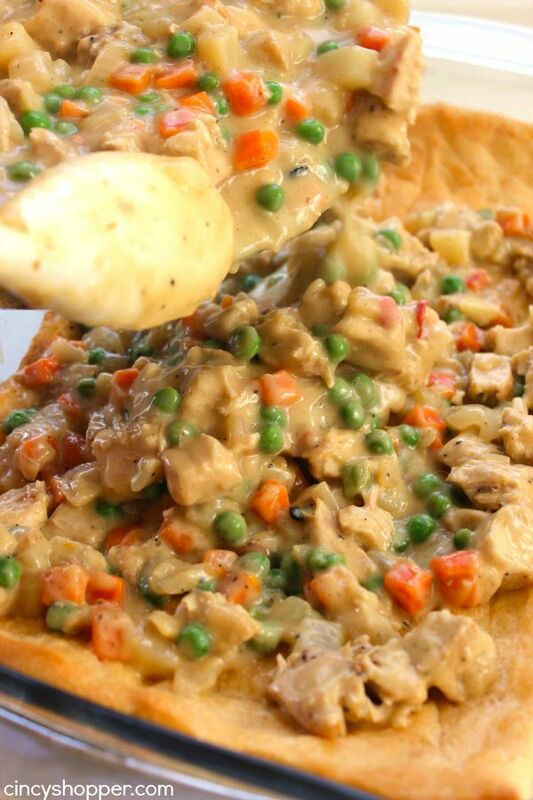 Have you ever tasted a chicken pot pie that actually has a lot of flavor?? I havent, this looks great! Got the mixture ready now, and it tastes like pot pie should! 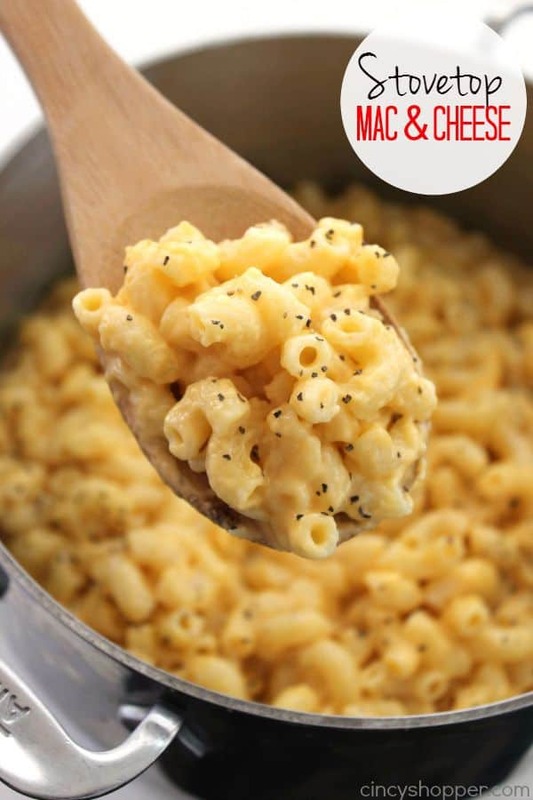 How can I make this using an 11×15 casserole pan? Just made this tonight! Excellent! We all loved it!! Thanks!! I’ve made this for years, but I make individual pies by putting 2 cresants together and use cream cheese and a tablespoon of melted butter instead of the soup. Plus trying to use up leftovers, you can use mashed potatoes. I made this for company and it was yummy. I did make few adjustments after reading through the comments. 2) Added about 2 Ts white wine before adding soup to veggie/chicken mix. I baked the bottom layer of crescents in the afternoon, as well as making the filling. When I was ready to bake it for dinner, I put the filling into the pan, then the top layer of crescents and baked. This was a great easy recipe that makes enough for a group. I will be making this again. Thanks! This dish was too good to be true! All we have is one corner piece left. I made this for my husband, 3 year old daughter & myself. We all had seconds! I did season the chicken very well (to my family’s liking), then sautéed the chopped onion in the same pan to absorb all the chicken drippings & seasoning. Also, instead of using plain cream of chicken soup I used ‘cream of chicken soup with seasoning’- just adds that much more flavor. The crust was not done when I first pulled it out and when I looked back at the recipe I realized I didn’t make slits for it to cook more thoroughly. With a few minor tweaks this recipe was a hit and will be making again! Definitely!! Thank you! Made this tonight and it was amazing! Instead of letting the frozen stuff thaw, though, I steamed the veggies in the bag and cooked the potatoes with the onion as I cooked the chicken in a separate pan and baked the bottom layer – it definitely sped up the cooking time! This looks delish! I am not a fan of cream soups, do you know a way to make this part homemade? Thank you for a great blog and yummy recipes! Lisa, I always replace cream soups in recipes for a simple “rue” idea. Equal parts butter and flour (I do a tbs of each and a 1-2 cups of milk). Melt butter in pan, don’t let it brown. Then add the flour until the rawness is out. A min or two. Again don’t let brown. Then add milk until disired texture and thickness. It will thicken as it cooks. Stir constantly. For cream of chicken I replace some milk for chicken stock. Season this mixture heavily. Otherwise it will be very blan. But don’t use to much salt! I can use pie crust instead? Any adjustment that would be needed? Ive seen recipes using pie crusts and puff pastry. Just google it. 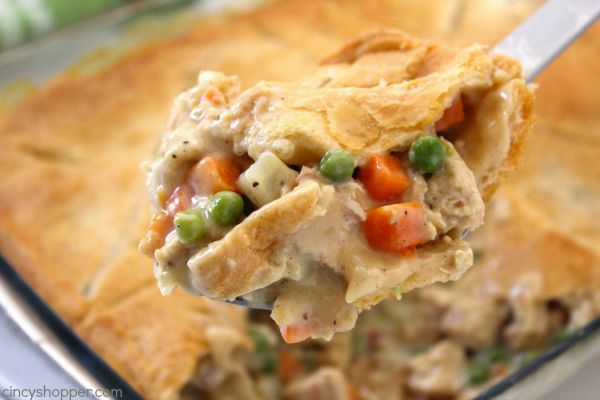 I made this pot pie tonite and it was a huge hit, even with my grandson! I don’t like to change recipes the first time I make them. It actually drives me nuts when others totally tweak it and then rate it. Tweak it and put your own recipe on the site. I like constructive criticism, not do overs. My husband loved it but said it didn’t really need the dough on the bottom. But he gave it 2 thumbs up.. Anyway … wonderful! Thank you. DELICIOUS!!! This was a huge hit!! Will make it again!! My husband is in love with this! I used the leftover turkey from Thanksgiving but will definitely make again with chicken. I could live with out the bottom crust but the hubs said no way, it’s perfect! Thank you! This was soooo good! I did not use the outlet seasoning because I don’t really care for it. Instead, I used salt, pepper, onion powder, garlic powder, and parsley. Most of the seasoning was used cooking the chicken. I added additional salt and pepper and parsley before baking. My son said it was his. Ew favorite! Turned out so good!!! I made this last night and thought it turned out great except that the bottom of the top layer was uncooked. I was embarrassed because we had company over for dinner and I didnt know how to remedy the problem! I even kept the casserole in the oven for almost 10-12 minutes longer because I read others having the same issue! Anyone have any suggestions? 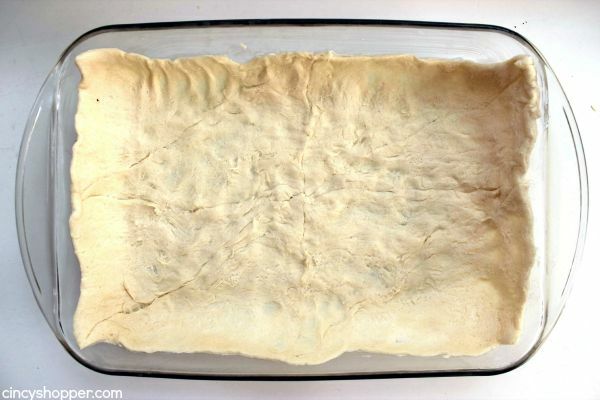 Would I have the same problem if I used a frozen pie crust? I even cut slits in the top like someone suggested, but that didn’t work. Hubby says this one’s a 10 for sure & I agree!! Very tasty and easy!! Thanks for a great recipe!! Please, has anybody tried freezing this dish? Thanks! THIS IS SO GOOD!!! A couple of thing S I tweaked from reading the comments: no bottom crust, sub water for chicken broth, add garlic and onion powder, cream of chicken with herbs. NOt bland at all!! It’s a huge hit in our household. Thank you!! Can I use a 13×9 casserole dish instead of a 11×13 with the same amount of ingredients? I agree. I want to know that, AND, the nutrition and calorie list. Very good, and easy to make even for a man. I made it twice. The second one I skipped the bottom crust. And only put flattened biscuits on top. The result was totally different and yet still good. And it was less carbs. I made this for dinner tonight. It is great. I would make this dish again. My 17 year old made this and it was phenomenal! We used Pillsbury big and buttery crescent roles (they were the only ones available) and extra and chicken. We also used a bag of frozen mixed veggies instead of the peas and carrots. The recipe filled the entire 11×13 dish. I would say even with hearty eaters this would easily feed a family of 4 healthy eaters. The flavor was great and it was very filling. Will definitely make this again. the same as 2 tubes of crescent rolls. 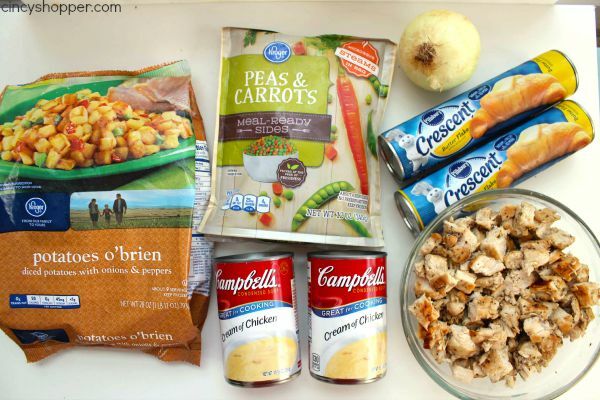 My family loves this casserole and it is so easy to make. I have to make two because they love it sooo much! Hi Erika! That is exactly what I would do. If you give it a try, be sure to let us know. I tried this tonight with a couple adjustments. I did cook some diced potatoes and put them in and it worked out great! I only one can of soup so it was a little watery and I used a can of corn, green beans and some freshly sliced carrots instead of frozen but still tasted awesome and I’ll remember to grab some next time I’m grocery shopping. 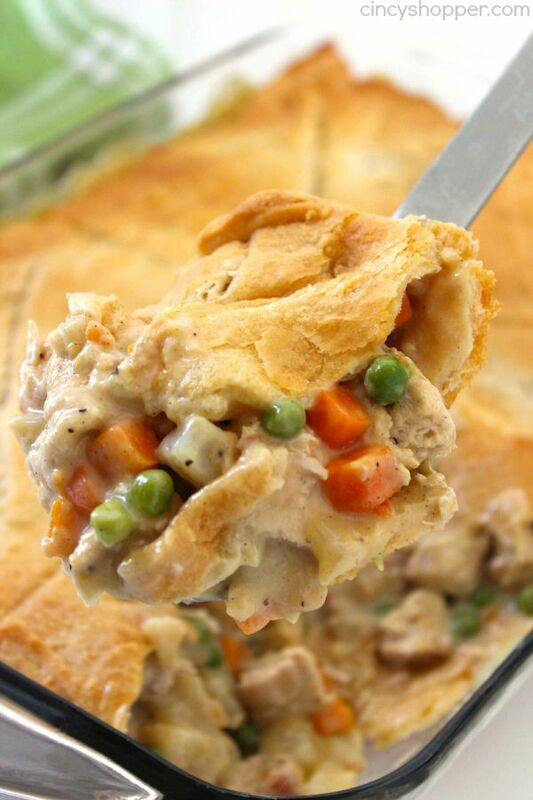 This will be my go to pot pie recipe from now on. Wow, very good. I added some black pepper and cayenne pepper. It added a touch of kick, but I can tell it would have been just as good without it. I’ll be making this again. To do the vegetables for this fish, do I just let them sit out all day to thaw or do I need to steam/boil them?? Made for dinner tonight. Changed recipe a little. Chicken broth instead of water. Cream of chicken soup with mushrooms and mixed vegetables (didn’t have peas and carrots at store). It was yummy even my husband agreed. I just made 5 of these bad boys for gifts (I needed to get rid of some casserole dishes)… so easy and cost effective… 60 dollars and enough casserole to feed 10 people easy! just wanted to say that I love your recipes. Made this tonight with quarter tsp. each thyme and sage. Not usually a fan of crescent rolls but they were on sale and we had a lot of leftover chicken so I tried it. Fabulous! Thanks for all your hard work in keeping up this super blog. could you use rotisserie chicken? Made this recepie for family the other night. I did use individual ramakins and omitted the bottom crust. It was a great hit and everyone was excited to be getting their own pot pie. Thanks for a great recepie! I made it. It is great. I would make this dish again. Thanks for your sharing! I made this for dinner tonight. It came out amazing. Thank you for sharing it. I made this tonight but used leftover turkey and it was a big hit! Great recipe, super easy, Thank you! These are wonderful. My family loves them. Has anyone ever tried to freeze these? How did it work? Would you just freeze the mixture and have to make the crust still the day of? I froze my second pie, uncooked. When I wanted to cook it, I put it in the fridge for the day to thaw. Then baked it. It took a bit longer to get the pie crust brown, but it was great. Perhaps a tad more watery than the pie I cooked the day I made these. My husband and son gave me a 2 thumbs up for this dinner. . Easy to make and very yummy. Definitely will make again. Anne, I am happy to hear your family enjoyed the pot pie. We make it often and my family always loves it. This recipe tasted great. However, there’s only two of us, so we had a lot of leftovers. That’s not the problem. The problem is that the crust became dough like again when we refrigerated it. Only did reheating it in the oven bring the crust back to normal. My husband wanted the leftovers to take for lunches at work, but that didn’t work out too great since he only has a microwave there. Is there anything I could do to prevent the crust from changing so much after it’s refrigerated other than reheating it in the oven? -I used rotisserie chicken (because I’m lazy). Just shredded it up and used it in the mixture. -I also used boxed chicken stock instead of water for flavor. -And since I made it for my husband and I (who aren’t the best with leftovers) I made half. I made the entire mixture but only used one can of crescent rolls. I used half (4 rolls) for the bottom and half for the top. I followed all the directions the same. I plan on freezing the rest of the filling and using it as a quick weeknight dinner in the future. Hope this helps those pairs out there! This is a yummy winter meal! I made this and it was amazing! I live in a house with VERY picky eaters and they loved it!! The only different thing I did was I used a rotisserie chicken (because I just got off work and needed something quick) and cream of chicken with herb. Other than that I followed the directions exactly and this was super easy to cook after work. 10/10 would eat again. Made this last night and my family loved it! I will most definitely be making again! Thank you! Made this today and used rotisserie chicken and used 1 can of cream of mushroom and 1 can of cream of chicken, rather than 2 cans of cream of chicken. I also used the Pillsbury crescent sheets cuz they were easy to maneuver without breaking! Absolutely fantastic! Will make again! Thanks for the recipe! 1. I used Turkey meat. Sprouts sells fully cooked white meat Turkey in slabs about a half inch think, no need to cook raw chicken. I just diced the Turkey and got done a lot quicker. 2. 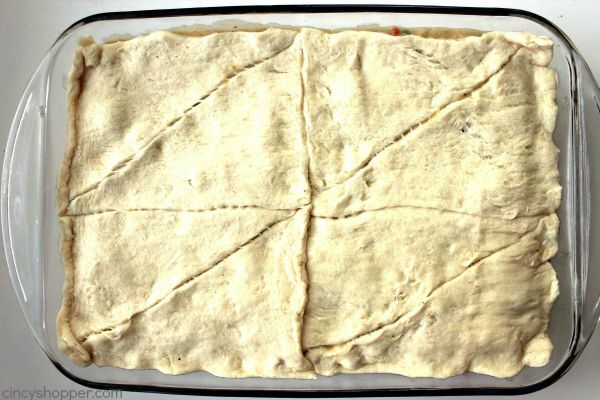 The Pillsbury crescent roll dough also comes as a single sheet without perforations; it’s easy to work with. 3. Could not find 12 oz Peas/Carrots. Settled for a 10 oz bag of mixed vegs (corn, peas, carrots, green beans). The market also sells the mixed vegs in a 16 oz bag and after cooking this recipe once I’m sure the 16 oz bag will fit fine and be better. I defrosted these in the microwave. 4. I used half of a 20 oz bag of the SImply Potatoes matchstick hash browns, we love these. 5. We’ll get six servings out of this.